The worst has passed for oil prices, which are now too low to ensure investment in the new supplies needed during the rest of the decade, IHS Markit Ltd.’s Vice Chairman Daniel Yergin said. Crude futures, trading near $48 a barrel on Wednesday, will rise next year to the “mid-$50 range,” Yergin said in an interview. The market is rebalancing as the global oversupply diminishes, with U.S. crude production set to fall another “couple of hundred thousand” barrels a day by the end of this year, he said. The recovery will be unaffected by any OPEC decision to freeze output, he added. While oil has climbed from the 12-year lows reached at the start of 2016, a persisting supply glut is pinning prices at half the levels of two years ago. Still, with global demand rising and oil explorers slashing hundreds of billions of dollars in investment, finding enough supply could become an issue again in coming years. It’s “too soon to say” whether the Organization of Petroleum Exporting Countries will agree to cap output when members gather for informal talks in Algiers next month, Yergin said. An initiative with non-members such as Russia collapsed in April because of political tensions between Saudi Arabia and Iran. Even if a deal is reached, it will simply formalize current output levels and have little significance for the market, Yergin said. 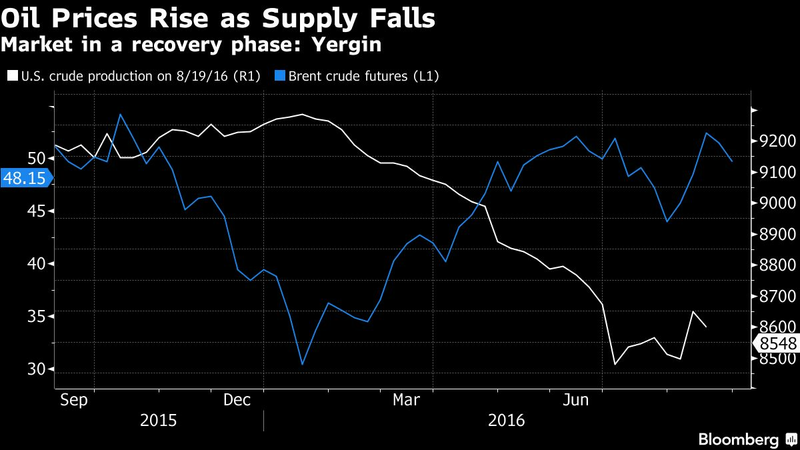 Regardless of whether OPEC announces an accord, supply and demand are coming back into balance in world markets, Yergin said. U.S. crude production will probably slide to about 8.5 million barrels a day as low prices take their toll on drilling, he said, adding that recent output was about 8.7 million a day. While the oversupply is ending, “an extra billion barrels of inventories” accumulated since 2014 continues to block a rally in prices, he said.